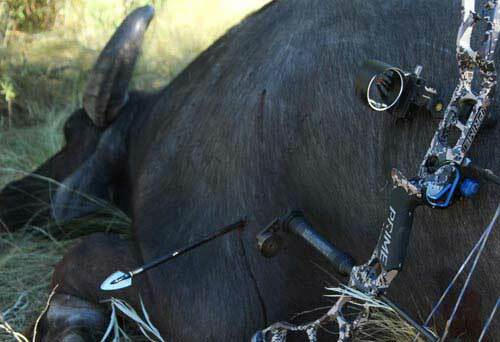 There is no single "big thing" to getting an arrow and broadhead system to penetrate. Dr. Ashby researched and documented the proven 12 steps to arrow penetration - listed below. The most important factor of arrow penetration is structural integrity. If any component of your arrow fails penetration either completely stops or is greatly reduced. GrizzlyStik broadheads are tempered to eliminate tip curling and broadhead twisting. Our Ashby and Nanook are forged for the ultimate in strength and durability. GrizzlyStik tapered carbon arrows are made with our special CrossLock™ woven carbon cloth to eliminate any weak spots. They’re thickest and strongest right behind the head, exactly where most other carbon arrows fail. If an arrow is not flying perfectly it’s wasting valuable energy that could have contributed to penetration. If an arrow impacts before it has achieved perfect flight, energy is wasted that could have contributed to forward momentum and penetration. Perfect flight is crucial, you must achieve it no matter what the cost. Pay close attention to the other factors too though or you may find yourself shooting arrows that fly perfectly but can’t penetrate well at all. GrizzlyStiks are the ONLY full length tapered carbon arrow available. Our full length taper recovers from archer’s paradox faster than any parallel arrow AND upon impact the stiff front end resists bending and drives the broadhead through whatever gets in its way. Tests have shown that EFOC, defined as 19% - 30% forward of center and Ultra EFOC, defined as over 30% forward of center enhances penetration from 40% to 60+%. The full-length taper of GrizzlyStik carbon arrows builds in EFOC and with our brass inserts, insert accessory weights, and broadheads up to 315 grains, you can customize your FOC to suit your own needs. Long narrow broadheads have an advantage over shorter wider heads. It takes less energy to push them through an animal. That is their mechanical advantage. This is second only to EFOC and Ultra EFOC as a penetration enhancing factor. Our Ashby broadhead is designed as close to the 3:1 ratio as strength and durability would allow. It has the highest mechanical advantage of any GrizzlyStik broadhead with the heavier Samurai series broadheads following close behind. You’ll lose up to 30% of your penetration potential if the shaft is larger than the ferrule where they meet. It’s best to be slightly smaller in diameter than the ferrule of the broadhead. GrizzlyStik arrows are equal to or less than the diameter of all the GrizzlyStik broadhead ferrules. Heavier arrows absorb more energy from the bow at the shot & they carry their momentum better than lighter arrows so they penetrate better. Bowhunters should use the heaviest arrow that will deliver a trajectory they can live with. The GrizzlyStik system of heavy full length tapered carbon arrows and broadheads up to 315 grains allow you to customize your arrow to reach your target mass weight for optimum penetration. Broadhead edges that have been honed and stropped smooth have a 26% advantage over smooth filed edges and a 60% advantage over the coarse “serrated” Howard Hill edge. All GrizzlyStik broadheads go through a final buffing process at the factory to make the edges as smooth and as sharp as possible. On all shots tapered shafts show an 8% penetration gain over parallel shafts and a 15% gain over barrel tapered shafts. GrizzlyStik carbon arrows are the ONLY full length tapered shaft on the market. That gives us an 8%-15% penetration advantage over all the other shafts out there. Smooth transitions and slick arrow finishes greatly enhance the penetration potential of your broadhead/arrow combination. Broadhead ferrules with bumps or any irregular surfaces impede penetration, especially in bone. Only if no bone is encountered does this factor rank 10th. If bone is hit, and more often than not it is, this factor jumps up toward the top of the list. If you can’t get through the bone, penetration stops. The powerful rotational force of single bevel broadheads splits bone. Single bevel broadheads regularly turn what would be a wound into a killing shot. Note: Your arrow must be of sufficient weight and strength to drive the broadhead through and withstand the forces involved in breaching the bone. All GrizzlyStik broadheads except the Silver Flames are single beveled. Their twisting motion splits bone allowing our tapered GrizzlyStik arrows to slip through and continue penetrating. In all testing where bone was encountered the Tanto tip performed best. It resisted damage and skipped less than any other tip design. All GrizzlyStik broadheads except the Silver Flames carry sharpened Tanto Tips. When soft tissue is hit, this factor is ranked last in importance BUT if heavy bone is hit it will be near the top of the list. Heavy bone is almost impossible to breach unless you have 650 grains or better in mass arrow weight. With the GrizzlyStik broadhead/arrow system you can reach the 650 grain mark with any of our arrows. Adapted from the Dr. Ed Ashby’s “Terminal Arrow Performance” seminar. Back to: "New to GrizzlyStik Gear"
See: "The Power of Momentum"
See: "Tissue Resistance to Arrow Penetration"